Liam Neeson has shifted from a serious actor to an action star. His recent roles signify that shift: Taken, Unknown, and now The Grey I imagine might have been played by men half Neeson's age (60). However, Neeson has such a strong and tough exterior (along with an almost growling voice) that makes him a natural for action films. Now in the last two films, he was a man on a mission and was a good man in terrible situations. The Grey has him a little more morally complicated and damaged, but no less tough. I liked Taken and Unknown. Ottway (Neeson) is a tough hombre in the wilds of Alaska, where he is a hired hunter for an oil company still mourning the death of his wife (Anne Openshaw, seen only in flashbacks and dreams). As a literal hired gun, he travels with a group of oil employees in a plane. On their way back to Anchorage, the plane crashes into deepest, darkest Alaska. Ottway survives, as do annoying lumberjack-like Flannery (Joe Anderson), Hispanic #1 Hernandez (Ben Bray), Hispanic #2 Diaz (Frank Grillo), Hendrick (Dallas Roberts), Black Guy #1 Burke (Nonso Anozie) and Talget (Dermot Mulroney). After taking account of all survivors, it's time to get our seven survivors and make it out alive. Ottway all but declares himself leader, the rest of them don't object, and Ottway gets the rest to band together. However, in the Great Northern wilderness, they have to contend with wolves, who won't stop until they have their fill. Now it becomes a battle for survival against the elements and the wolves. Diaz does not like Ottway's rule, especially since he stops Diaz from stealing from virtual grave-robbing. However, after one of their own is devoured by one of the wolves (take a guess...think of a number...), it's time to move on. Soon The Grey takes on a And Then There Were None vibe, where one by one our ill-fated groups is destined to be picked off one by one. As we continue our journey of survival, we get to know them a little better. We have the cynical Diaz, the philosophical Talgert, the man of some faith Hendrick, the noble Burke (the one with the cough). We continue marching onwards, not knowing who will survive. What I found about The Grey is that, with just a little more thought into it, it might have been worth the time. Unfortunately,director Joe Carnahan and co-screenwriter Ian Mackenzie Jeffers (adapting Jeffers' short story Ghost Walker) is so amazingly cliched and worse, boring, that one loses interest. It's a cliche that certain characters won't make it out alive (seriously, while watching did anyone think the guy hacking away in the tundra was going to be in the closing reel?). It's a cliche that at least ONE of the survivors would make some try to be an antagonist to our hero. Even more obnoxious is that we had stereotypes populating The Grey: the noble black man, the thug-like Hispanic...could they not come up with more complex characters for us to root for? I think this is why The Grey ends up being a frustrating film: we don't KNOW any of these characters save for Ottway. If the film had given us a chance to know these characters pre-crash we would have been given a reason for caring about their fates. Instead, because the story is so squarely centered on Ottway, all the other characters are just there for one purpose: to die. As we see our survivors picked off one by one (mostly by the wolves), we can't be asked to mourn for them because we simply don't know them. When we are presented with the idea that these were 'real people' and not just characters, it comes across as almost grotesque rather than heartbreaking. One death is accompanied by the image of the character's six-year-old girl comforting him just before being devoured. When we see a montage of photos drawn from the dead men's wallets, it looks almost sick at how their deaths are being thrown at us. Only so near the end of the film are they being presented as people, so having reminders of their lives pre-crash doesn't hit us emotionally. It makes us feel repulsed. The Grey also indulges in more terrible movie moments. Marc Streitenfeld's score hammers away at us, forcing the sense of tension and drama that should come from the story. At times Masanobu Takayagani's cinematography is nice to look at, and other times becomes hard to follow. All the actors are pretty disposable given that their characters are not only disposable but indistinguishable one from the other. I think more established actors like Mulroney did the very best they could with virtually nothing to work with. All the other actors were badly directed: a scene between Hendrick and Diaz is especially painful to watch in their emptiness and stilted performances. 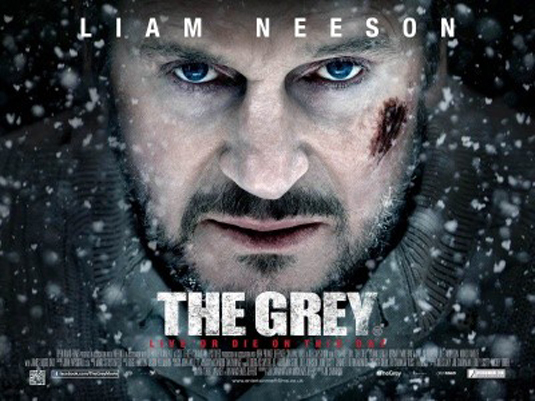 Neeson likewise did the best he could, but again, there is nothing in The Grey to hold any interest. He is the only character given a backstory, not well-handled, but at least we are asked to care about him. We just can't because we are too involved trying to have him play hero to give much thought over his emotionally fragile state. The Grey at least has one thing in its favor: it certainly lives up to its title.